The holidays are gone and the fun seems to be fading away. However, its nothing like that at Betsson. 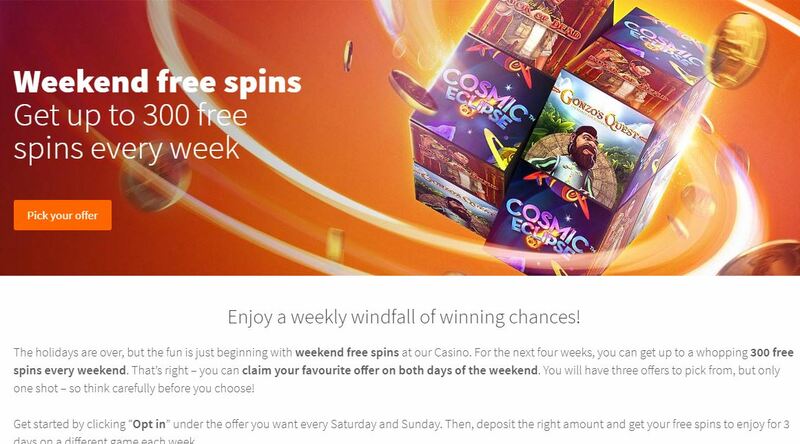 The casino has been awarding its customers with 300 free spins every weekend since 6th January this year, but the four-week offer will be running until 4th February. The offer is only available for Finland, Norway, Sweden, and Iceland citizens. An eligible customer will be awarded three offers from which they will only pick one and can be claimed on both Saturday and Sunday. The offer can only be claimed after opting into the desired offer (by clicking OPT-IN) and depositing the required amount of money. Once a player deposits money, they are awarded the free spins which can be used to play a different game per week. When you deposit €25, €50, or €100 you get a 25, 50, or 150 free Spins respectively on the selected game. Here`s how the Weekly Bonuses are Listed. The first-weekend slot game free spin was on 6th and 7th January this year on the Cosmic Eclipse slot; a trip into space where wins are found among the stars. The second week’s slot game free spin was on 13 and 14th January on the Book of Dead slot game; opening the Ancient Egyptian tome to discover forgotten riches. The third week`s slot game free spin offer was on 20th and 21st January, the Gonzo’s Quest slot game; joining the explorer’s heroic journey to get to the city of treasures. Lastly, week four will be on 3rd and 4th February with the final offer on the Planet Fortune slot. The Planet Fortune slot game will offer players a chance to discover a whole world filled with potential winnings. 10% – For all table games (except the live tables). 25% – For all other Live Casino Games. 10% – For Live Baccarat, Live Blackjack and Live Roulette games. 100% – For Slot machines, Video Slots, and Lottery Games.- The site has a list of games that the bonus offer cannot be wagered on. Some of them include the Big Bang, Aliens, Castle builder, Blood Suckers, and Pearls of India among others on the long list. Clients should check the list before playing.- If the player has an active bonus, they are given a maximum stake of €6 for every round of a game. Alternatively, the player can be given 50 euro cents per line. Any bets placed beyond the stated limits might lead to an account termination.- Only one customer, household or IP address is allowed for the offer and in case of any dispute, that is related to the free spins promotion, Betsson becomes the final decision maker. No discussion or correspondence shall be accepted.